A new battle is brewing among fullsize pickup trucks. On top of boasting horsepower or towing capacity figures, it seems the next generation of pickup trucks will also be getting pretty serious about fuel economy. With General Motors and Ram recently unveiling their latest pickups, Automotive News is reporting that Ford is working on the next-generation F-150, which is expected to include a lighter curb weight and higher fuel economy. Reports of Ford cutting weight and using aluminum to do so on the next F-150 aren't new, but the AN article is finally putting a possible target fuel economy to go along with the expected 700- to 750-pound weight reduction. Currently, the F-150 with EcoBoost delivers the best highway mileage of up to 23 miles per gallon, which is off the pace of the 2013 Ram 1500 that stands as the fuel economy leader (for now) with up to 25 mpg on the highway. But Ford may be looking at a three-mpg gain on its new truck; official EPA ratings for the 2014 Chevrolet Silverado and 2014 GMC Sierra have not been released yet. 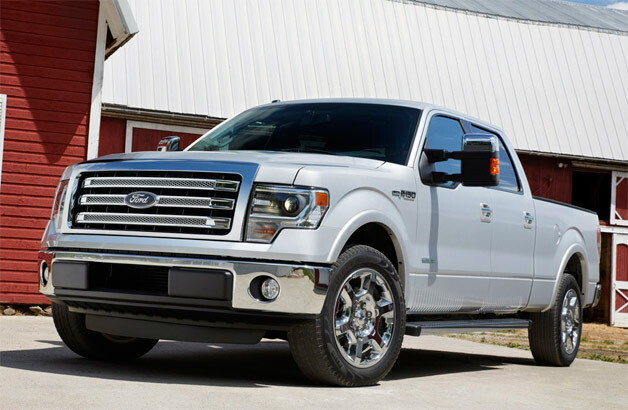 The article also mentions small-displacement (2.9 liters) engines and a shared Toyota hybrid technology, but it isn't clear if either would be used in the 2016 F-150. Until then, AN says that Ford is planning to bring an eight-speed automatic to its fullsize truck within the next couple of year.Ford F-150 to counter new GM pickups with 3-mpg improvement originally appeared on Autoblog on Fri, 14 Dec 2012 15:31:00 EST. Please see our terms for use of feeds.